Fuel Cells — Vanny et al. Simply put, a fuel cell converts chemical energy to electrical energy. Some chemicals like petrol or natural gas, contain a significant amount of energy, which you can harness with a combustion engine to power your car for example. On the other hand, it is possible to create energy when two molecules react. For example, hydrogen and oxygen react spontaneously when combined to create water and energy (which is quickly given off as heat). This is called spontaneous combustion. The clever way to harness the energy created (without losing most of it as heat), is to use a Fuel Cell. The fuel cell consists of three components: two electrodes and one layer called a electrolyte. The electrolyte separates the two gases from spontaneously reacting, while the electrodes are where all the fun happens! The genius of a fuel cell is to separate the overall reaction into two reactions called ‘half-reactions’ that occur at an electrode. The figure below shows is a simple schematic of what that looks like. 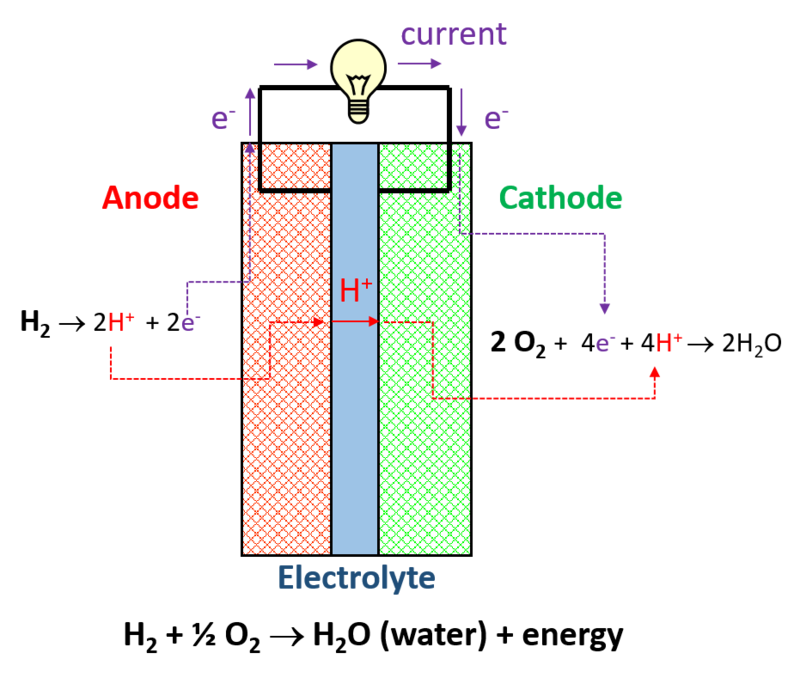 Fuel cell schematic showing the main components; electrodes and electrolyte. Now you know how a fuel cell works, let’s go into a bit more detail. Let's revisit General Chemistry, recall that every molecule is composed of atoms, that are composed of electrons, protons and neutrons. Electricity is basically the flow of electrons. If we are purely concerned with generating electricity, then getting the electrons out of the above reaction is how we are going to do so. How does that work? At the electrode with hydrogen, called anode, the hydrogen gas reacts with a catalyst to form protons and electrons. Those electrons can be harnessed to do useful work. Consequently, the proton diffuses through the electrolyte, to the other electrode, called cathode. At the cathode, the oxygen reacts with the proton and the electrons (that have been working hard to power your device;) to form water completing the circuit. The nature of this device is that the circuit or cycle must be COMPLETE, for the electrons to keep flowing from the anode through your device back to the cathode. If there is any breakdown in any component. The device stops working and does not generate electricity. A fuel cell flow showing the pathway of protons, electrons and neutral atoms in a working fuel cell. So, all seems fair and easy, why aren’t there fuel cells everywhere? COST. (1) Getting hydrogen and oxygen safely in a device is cost-intensive. Fuel cell design is the subject of extensive research. (2) Getting ‘clean’ hydrogen. There is debate about using ‘dirty’ H2 (produced with CO2 emissions from fuel refining) to produce ‘clean’ energy. The upside is there is extensive research on H2 production, as well as, research into how to operate fuel cells with syngas (H2 + CO- a common dirty byproduct of fuel refining. Finally, H2 fuel cells are a small subset of the various types of fuel cells available. There are methane fuel cells, alkali fuel cells, methanol fuel cells, and CO2 fuel cells and so on. All with the general goal of producing energy without the emission of green-house gases. (3) The catalyst required for breaking the hydrogen (or whatever fuel type) into its components is very expensive. Currently, the state of the art catalyst is platinum or palladium ($$$$). Fortunately, there are a few research groups working on alternative catalysts, so the future could be literally lit with the power of chemical reactions. We can take encouragement from the fact that fuel cell costs are already 75% less than they were 13 years ago. Companies like FuelCell Energy, SAFCell, and Bloom Energy, are leading the way!